KIEV, Ukraine -- Both Ukrainian and Russian are still widely used in Ukraine, a vestige of a their interwoven history. But today, language itself has become a political fracture point, one that serves as a guide, plotting the political course of the country. 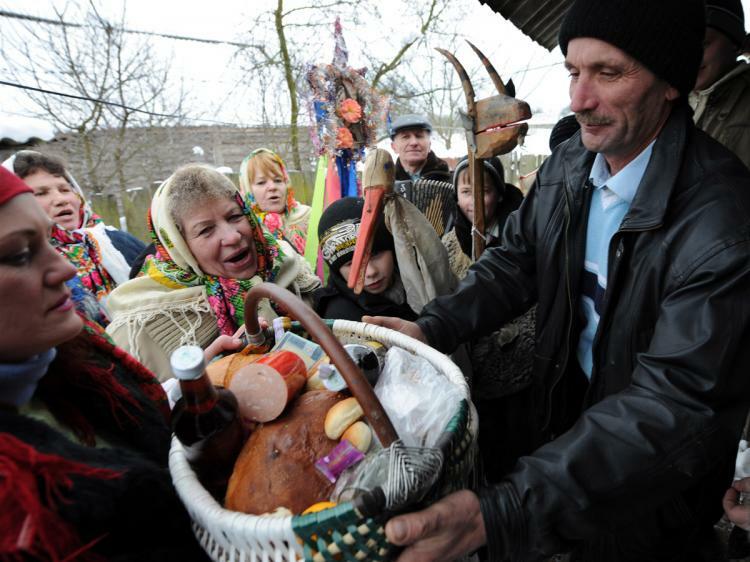 A Belarus man offers a basket of food during the traditional Ukrainian Christmas (Koliady) on January 7, 2010 in Pogost, some 250 km south-east of Minsk. The conflict stems from which language–Ukrainian or Russian–is given preference at the state level in Ukraine. Legally, Ukrainian is the only official language, but Russia has always wanted to have its tongue recognized as an official second language. The situation has provoked, from time-to-time, protests mainly organized by nationalist forces. In newspapers, magazines, and books sold in Ukraine, most of the content is in Russian. In the central part of Ukraine, in the capital region of Kiev, the two languages are used fairly equally. Starting to travel west, Ukrainian is used more, but to the east people mainly speak Russian. The language debate exemplifies how Ukraine is divided into two parts: a west that faces the European Union, and a Russian-facing east. The results from February’s presidential election shows this separation with the western regions mostly supporting former Primer Minister Yulia Tymoshenko, while the east mainly sympathized with a Russian-leaning Victor Yanukovych. According to surveys conducted by Kiev International Sociology Institute (KISI), since Ukraine’s independence in 1991, the language issue has always divided the nation’s people and politicians have used it to their advantage. The division has been evident in each presidential election. Officials have been exploiting the issue as a tool of electoral manipulation, according to social scientists. “The differences over which politicians struggle with each other are partly linked to language,” said Valeriy Hmelko, president of KISI, in an interview with NTDTV. At the same time, the surveys show that most Ukrainians support maintaining good relationships with their Russian neighbor. The expansion of the Russian language across Ukrainian territory is due to the Russia empire’s policy of Russification over the last two centuries. This policy continued to be reinforced by the leadership of the Soviet Union as well. Former Ukraine President Victor Yushchenko (2004-2010), following his own nationalist views, considered Ukrainian to be the only language of the country. He launched an intensive Ukrainization program, earning him criticism from Russian-speaking Ukrainians and from the Russian-leaning opposition. Under Yushchenko, more than half of the TV stations gradually started broadcasting in Ukrainian. But with the arrival of a new president, pro-Russian Victor Yanukovych, Russia expected that the language issue would be resolved, and Russian will be entrenched as the state’s official second language. Yanukovych repeatedly talked about this in his electoral campaign. But earlier this month, he surprised everyone by declaring that Ukrainian would be the only official language, thus destroying Russia’s hopes of exerting more influence over its former territory. Yanukovych stated that Russian would remain the language of minorities in the country.